There are a lot of lifestyle changes that can be made for better health including a good diet, sleep, and exercise. We are often told to decrease our stress load to better our health; although, one of the most unavoidable aspects of anyone’s life is stress. Leaving stress unchecked and suffering from it in the long term can contribute to high blood pressure, heart disease, obesity and diabetes, things that we generally associate with other habits like diet or exercise. It is important to understand, however, that stress is a normal experience and can even be beneficial in order to motivate us and make use more efficient. Contrary to popular belief, a little bit of stress can be good for you, but only in small amounts. Stress is an quality that helps with growth and adaptivity. It keeps your body active and utilizes the natural built in systems that are primed to make us adapt to situations. Stress is tied to the well known fight-or-flight response, which involves systems all over the body, and triggers the release of hormones that can affect different parts of the body’s system. One of the main hormones involved in stress is cortisol which plays a vital role in the HPA axis, which is involved in an individual’s stress response and regulates the release of other hormones. This pathway is implicated in many common affective disorders, like anxiety and depression. 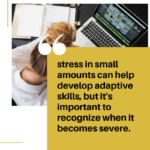 Prolonged stressors like financial issues or low socioeconomic status are examples of long term stressors that can wreak havoc on a person’s health and cause dysregulation of the HPA axis. Everyone faces stress in their lives and being able to manage them is important. Having the ability to de-stress keeps the body’s systems in check and helps people manage their mental and physical health. There are many things that people do in order to maintain stress levels. Whether it is a relaxing bath, yoga, or meditation, these are all healthy ways to protect yourself from stressors and give you time to collect your thoughts and relax. Exercise can release hormones that combat stress and can help regulate stress. Socializing and building connections is also a great way to manage stress, because it provides a strong and positive support system. It is important to recognize when stress becomes severe enough to require medical attention; this can be the case when you find your daily life, work life, or personal life is being debilitated due to the excess stress. Different kinds of therapy can be useful if stress has become an overwhelming part of your life. Cognitive Behavioral Therapy can be helpful in understanding the causes of stress and help tackling it in effective ways by helping people form a strategy and modify their behavior and thinking. Another possible route of treatment is biofeedback therapy for stress, which involves making people aware of their involuntary body processes and learning to control them in order to reduce stress. If you or someone you know is struggling with a mental health disorder, like depression or anxiety, please feel free to contact the professional team at Lifeline Connections for help. Getting yourself help, whether it is through self-help or by reaching out to professionals is an important part of recognizing that you are struggling and is a good step forward to get the help that you need. You can visit lifelineconnections.org or call 360.397.8246 for more information.